Have you ever tipped back your head and looked up at the immensity of the night sky, clothed with twinkling stars, wandering planets, itinerant comets and the flash of the International Space Station whizzing by? An impressive sight even from the city , if you’re privileged enough to be on top of a volcano in the middle of the Pacific such as Mauna Kea, the garland of the Milky Way and billions of shining stars strewn about it, carelessly, are awe inspiring. Now imagine instead that you took a ride on one of those comets as it was speeding toward the earth or perhaps you’re more conservative and suffering from a touch of motion sickness, imagine you were floating about the cupola of the International Space Station having turned a few somersaults and took a look at our beautiful, blue planet as the sun set, what would you see? Vast expanses of darkness, interspersed with twinkling lights, immense oceans bordered by pulsating city lights. A delicately poised universe, lit up with lights of every kind, incandescent, fluorescent and most recently Light Emitting Diode (LED) lights. 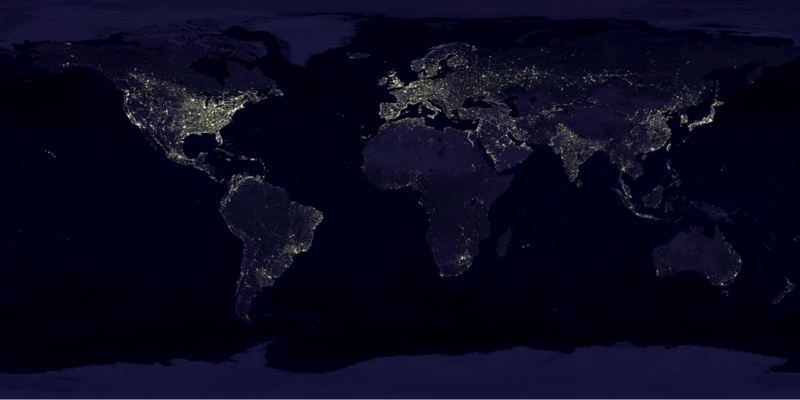 Visible Earth, Night Lights. Credit: NASA. Perhaps you’d prefer to be earth bound and leave extraterrestrial flights to the imagination or just your dreams. Not to worry, even if you were to just take a stroll with a loved one on your arm through the city you live in, quite likely, even without knowing it, your city’s skyline would be brightened by an iconic monument artistically lit with LED lights. If you were in San Francisco, it would be the City Hall. If you were in Toronto, headed towards a Blue Jays game or perhaps taking your child towards the Aquarium, the silent symphony of white, green, saffron, purple, orange, red and elusive tints that register as quickly as they disappear would be from LED lights on the CN tower. 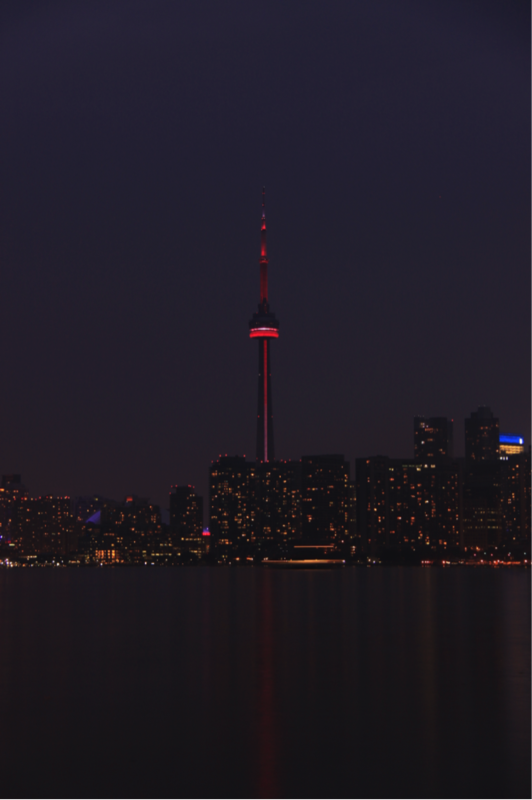 The benefit of lighting a monument such as the CN Tower with LED lights, according to Susanne Seitinger, Global sub-segment manager at Philips Lighting, is the ability to install light where it can hug the contours of the building allowing for a more intimate and interesting lighting installation as opposed to traditional flood lighting systems which typically need to be installed further away from the building and consume 50-80% more energy. Before it was lit with LED lights in June 2007, the CN tower used older light sources which would not have supported any easy colour changes or dynamic effects. In addition to lighting portions of the building beautifully some of the light produced would spill over where it was not necessary. With LED lights, the light produced is highly directional and each colour is produced without the need for filters. Software is used to select a colour from the entire gamut of possibilities using the primary colours of red, green and blue. CN Tower from Toronto Island. 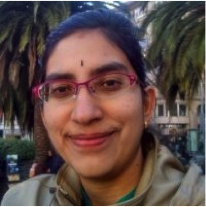 Credit: Sri Priya Sundararajan. Perhaps you’re in Paris, that enchanting city that has been charming visitors and locals alike for centuries and have stepped into the Notre Dame, hoping for a glimpse of Quasimodo, instead you would be bathed with lights in alcoves, not candle light, but LED lights. If you walked back towards the Seine, perhaps you catch a glimpse of the Eiffel tower, glowing golden in the projected light from yellow orange sodium lamps if it were an ordinary day. If it were a special occasion, such as it was in October 2009, perhaps you would have seen the grand Eiffel, festively bathed in LED lights in honour of its one hundred and twentieth birthday. Your average run of the mill light bulb, has a filament in it made of Tungsten, an element that poor Thomas Alva Edison found worked to produce light, after finding the many others that didn’t, one by one. Most of the energy produced is heat and less of the energy produced is visible light. That’s why if you touch a light bulb or hold your hand close to it, after you just turned it off it feels hot. If you touch an LED bulb, after you just turn it off, it feels cool, because light from a light emitting diode, by contrast is much more efficiently produced. Light is produced when an electron drops into a vacant spot in energy space, emitting a photon, like you might drop into your favourite chair, after a long day’s work, sighing happily. Just as how loud your sigh is would depend on how much energy you had to spend to drive, walk or take the train, so too the colour of the released light would depend on how much energy the electron lost as it occupied the vacant position in energy space, dropping down from a higher spot. The spacing of energy states is a fundamental property of the material the electron is travelling in, a fact that allows LEDs to be tailored to emit different colours of light. For example, the red blinking light that tells you if your boiler is on or off, or perhaps whether the battery in your TV Remote is alive, is made of GaAsP, which is a semiconductor. That is it’s not as good as copper at allowing electrons to move freely through it but not as bad as wood. Materials can be made of one kind of atom like copper, or two or three kinds of atoms like wood which is made up of carbon, hydrogen, oxygen and nitrogen amongst other things. Semiconducting materials are similar, in that they can be made of one kind of atom, arranged at regular intervals within a lattice, like silicon that your computer’s brain is made of or two, or three or even four types of atoms, like some light emitting diodes are. By picking different kinds of atoms and mixing them, and allowing them to sit at a different physical spacing with respect to each other in a regular manner, you can alter the allowable energy states that an electron travelling in them would see. This is the trick which allowed scientists and engineers to compound semiconductors to manufacture lights that illuminate the Bay Bridge, the CN tower and the interior of the Notre Dame in ever possible colour you could imagine and some you hadn’t. By the same token, if you allow an electric current to pass through a device made of these alloys, by applying a voltage, under the right conditions with the appropriate mix of elements, electrons and holes recombine to produce visible light, in a process more formally known as injection electroluminescence. This is the working principle behind the world’s first visible light emitting diode made in 1962 by Nick Holonyak Junior, who at that time was working in General Electric’s laboratory in Syracuse New York. In August 1958, Schawlow and Townes of Bell Labs proposed the extension of microwave amplification techniques to generate optical and infrared frequencies in a seminal, elegant and ground breaking paper. In August 1960, the world’s first pulsed solid state laser, was practically demonstrated with a ruby crystal at its heart by TH Maiman of Hughes Laboratories. In December 1960, Javan, Bennett and Herriott of Bell Labs demonstrated the first gas laser that could generate a continous beam of light instead of light pulses, using a plasma struck across a mixture of Helium and Neon, affectionately known today by those in the photonics field as a “HeeKnee”. The first semiconductor laser made of gallium arsenide which emitted near infrared light was brought to life in November 1962, by Hall and associates at GE Research. These discoveries along with the space race sparked interest in the development and deployment of optical masers, as lasers were then known. It is into this arena that Nick Holonyak Jr. stepped and contributed in December 1962, demonstrating the first tunable light emitting diodes and lasers and that were capable of emitting visible light using a three element semiconductor alloy composed of Gallium Arsenide Phosphide. This can-do attitude to making things allowed Dr. Holonyak to take a radically different approach to form a three element or ternary alloy of Gallium Arsenide Phosphide, by heating two two element or binary alloys of gallium arsenide and gallium phosphide with a metal halogen containing compound in a closed ampoule. This was a method that many chemists thought would never work, as they were in favour of a slowly heating a gallium arsenide crystal in a stream of gaseous phosphorous to make the same three element crystal. Yet, Nick’s method did work. By incorporating phosphorous into a gallium arsenide crystal matrix using a novel method, Dr. Holonyak made a beautiful tunable red light source. The tunability of the light source arises from the ability to incorporate different fractions of phosphorous into the original gallium arsenide matrix, depending on processing conditions, and thus alter the electronic properties of the semiconductor material made, as long as a little less than half the original arsenic atoms are replaced by phosphorous. Nowadays, these red LEDs are mass produced inexpensively for less than five cents and blink at us helpfully from all corners of our homes and office spaces. To make the red light that blinks at you in the dark from various devices, scientists used gallium arsenide phosphide, to make amber light they used they added nitrogen defects to gallium arsenide phosphide, but for a long time they were stuck as to how to make blue light. The reason is because there were a lot of nooks and crannies in the compound semiconductors, such as Cadmium Selenide and Gallium Nitride, that an innocent electron could get stuck in and never reach its destination, stuck forever in the darkness. To make white light, you need to be able to make red, green and blue light and mix all these colours together. That all changed when an intrepid researcher, named Shuji Nakamura, convinced his boss and worked on a project which had little chance of immediate success and grew compound semiconductors with less nooks and crannies and more easy ways for the electron to fall into place to produce bright blue light. For this achievement, he was awarded the Nobel Prize in Physics in 2014. The ability to produce blue light opened doors that were closed before, for humble LEDs to leap out from the remote controls and boilers from where they had been blinking at us mildly, in our homes, to light the monuments and towers from whence they could dazzle us in our cities. The reason is that the only way to produce coloured light before was to make a lot white light with inefficient incandescent sources, like Edison’s tungsten light bulb and to insert filters to get the colour of light you want out. So for the kind of light you want, you have to make other kinds of light you don’t wasting energy. 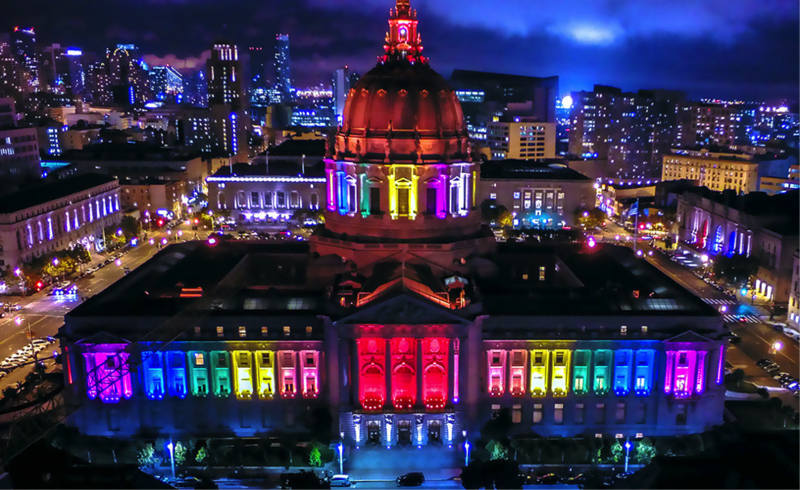 For example, in San Francisco recently the City Hall, called the People’s Palace switched to LED lighting for its exterior and interior to celebrate its 100th birthday, resulting in energy savings of close to 50% on an original energy budget of tens of thousands of watts. San Francisco City Hall Centennial Celebration. Credit: San Francisco City Hall Centennial Celebration website (www.sfcityhall100.com/projects.html#ledlighting). Public monuments worldwide are making the switch to LED lights, those iconic landmarks that define where we are, like the Gateway of India, in Mumbai, the Rijksmuseum in Amsterdam, the Edinburgh Castle in Scotland, the London Eye and the Allianz museum in Munich. How can you tell if a building or monument is lit by LEDs or conventional light sources? For one, if there subtle colour schemes, if the lighting hugs the contours of the structure and changes even as you watch it, its quite likely LED lighting. We can start making the switch from less energy efficient light sources to LED lights in our homes and the places we visit on a regular basis. The ways in which we produce electricity worldwide rely heavily on coal fired power plants and other methods which are potentially hazardous to the environment like nuclear plants which produce waste that nobody wants and that can be harmful for years to come. Wind energy and solar energy, allow us to produce a lot of energy some of the time but can be temperamental, producing little energy when we need it the most like early in the morning or late in the evening, making it hard to rely on them solely for our energy needs. As such, if we conserve as much energy as possible, replacing old incandescent light sources with cool and energy efficient LEDs, we could use the electricity we produce today more wisely. Wouldn’t you call that a bright idea? So go talk to the people who light up your public spaces and make a change in your home. Let me know what you switched or got switched to a more energy efficient version. Change one ordinary light bulb to a LED light bulb, go on now, change two or more. It may be a bit more expensive today but it will cost the earth less tomorrow, so that whoever happens to be whizzing by on a comet or turning somersaults in the Space Stations of the future will ,still, have a fragile and strong, bright and dark, blue twinkling planet to marvel at. I would like to thank Susanne Seitinger of Philips for being a treasure trove of information and for taking time to speak with me about LED lighting in the context of public monuments. Thanks to Kate O’Connell of Phillips for her time and for corresponding with me. I’d like to thank Edward Herath of Ketchum and Talley Summerlin of Emanate PR for arranging for putting me in touch with Kate and Susanne and for pointing me to Colour Kinetics related research materials. the study and enjoyment of light, in all its forms.